They say familiarity breeds contempt. That's not a word that would ever be used in the GAA family though. In that lexicon maybe contempt would translate as 'healthy respect'? Either way, however many times Kilkenny and Tipperary have faced off against each other, every time a rematch looms, the intensity/anticpation reading seems to go up a notch. On the run in to Sundays appetising Nowlan Park encounter, both counties appear aggrieved and out to prove a point. Kilkenny were largely written off (by some) as a hurling force heading into 2018 after failing to win any silverware last season, but have found their way back into a national final as hurlings most successful manager recalibrates the Noreside machine. There also seems to be a few noses out of joint around the Marble city over the recent change in the hurling order. Exhibit A from Richie Powers twitter account after this piece of play last week. (It was a superb back pass in fairness). Richie's also indicated that in Kilkenny they tend not to go out to beat Tipp but 'bury them'. Will those words be pasted on the Premier dressing room wall this weekend? Something worth mentioning in the preamble anyway you would imagine! Tipp are out to assert their credentials. They came to within a point of a back to back All Ireland Final appearance last September but collapsed in last years league decider when Galway blew them away with a 3-21 to 0-14 point victory at the Gaelic Grounds. Premier boss Michael Ryan has also been under the Tipp bonnet this spring and the way they came through their Limerick test was impressive given the shannonsiders persistence. A win on Sunday for either side would lay the ideal platform for an extended summer and boost the confidence of each squad's newcomers that they can land more silverware this season. There's also a bonus trip on offer for the Allianz Hurling League Champions this weekend. The GAA have confirmed the winners will join All-Ireland champions Galway on a trip to Australia next November where they will face each other on November 11 for the Wild Geese Trophy as part of the Sydney Irish Festival. That match will be a headline event in what is a major two-day Irish festival at the Sydney Showground showcasing Irish culture, music, food, drink and sport over the weekend of November 10 and 11. Hardly something that would see a team blow the dressing room doors off the hinges heading out for throw in but a nice additional benefit of lifting the trophy. The public appetite to see these hurling heavyweights slug it out is reflected in strong interest in ticket sales for the match. Both of the main stands at Nowlan Park are on course to be fully sold out with supporters reminded they can save €5 if they buy stand tickets early and before match day at a cost of €25. Match day stand ticket prices are €30. Tickets for children U16 are €5. The value of a win for either county? Priceless. 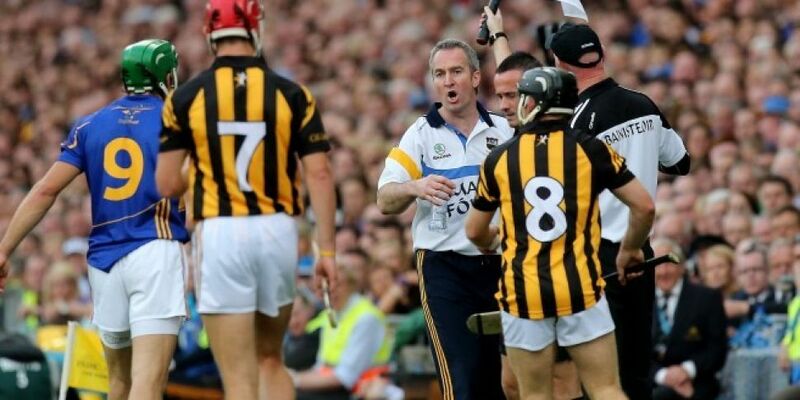 Tipp won't get within an asses roar of the cats if they mark like they did in their last meeting there in February which Kilkenny won by a point, they won't have a hope of a win simply because the Cats are even sharper now. That game in February was Kilkenny's seventh successive victory over Tipperary at Nowlan Park since last losing to them at home in the 2008 league semi-final. That Sunday could represent an 8th successive loss for the Premier at the venue should be just enough for Tipp to get over the line.